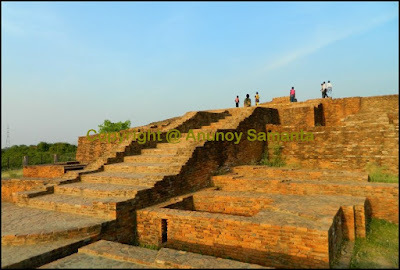 A visit to Shravasti was long due in my travel wishlist, even much before I visited Lumbini. 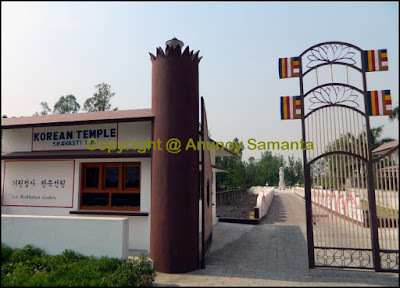 A trip to Lumbini had already infuriated my appetite to cover rest of the prominent sites of the Buddhist Circuit. Finally I could make the trip in April 2013, capitalizing the holiday of Ramnavami. 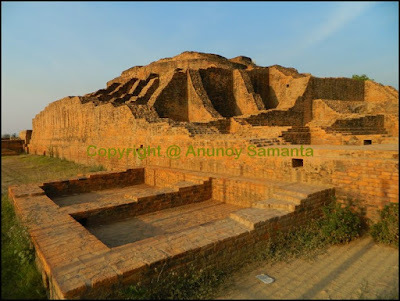 Though the earliest reference of Shravasti are well documented in Ramayana, Mahabharata and other ancient scriptures as a flourishing capital in the kingdom of Kosala, today it remains as a village of ruins (courtesy to Archaeological Survey of India) with overgenerous poverty in the state of Uttar Pradesh. Shravasti had derived her name from the founder Suryavanshi King Sravasta and had been the sole witness of 24 rainy seasons of Lord Buddha! Now it is just another underdeveloped Buddhist pilgrimage site attracting millions of Buddhists (and don’t forget the Jain pilgrims), especially from Buddhist countries like Sri Lanka, Myanmar, Thailand, Korea, Japan etc apart from wandering Indians. In this travel story of Shravasti I’ll include more details of everything than I usually prefer to do, because I’ve noticed that there is only superficial information available in Internet about this place. I got an accommodation at Dhamma Ashoka Baudh Vihar. I boarded a bus from the border town of Rupaidiha for Bahraich and covered that 51 kilometers ‘one of the worst’ metaled road in a couple of hours. From Bahraich one can avail UPSRTC buses for Balrampur which are in plenty at fairly regular intervals. Shravasti is just 48 kilometers from Bahraich and I reached there by 3’o clock afternoon. Having heard much about their accommodation I went straight to the Korean temple (yes, it lies by the main road) but I was denied of a room by one of their staffs giving the excuse “Sir, we have locked up our guest rooms after March since it’s of-season now”. Though I had faced similar rejection at Korean monastery of Lumbini, I had high hopes from the one at Shravasti. Their walls shining with Buddhist quotations like, “A great rock is not disturbed by wind; the mind of a wise man is not disturbed by either honor or abuse”… the exact words I needed to avoid the development of any negativity in my mind at the holy place! I came out and luckily got an accommodation at Dhamma Ashoka Baudh Vihar which was located just opposite the Korean temple. An excavated structure at Maheth. I was welcomed with nice hospitality by Ven Ashoka, the president of the establishment. After a short chitchat he advised me to hurry for the Thai Temple which is closed by five in the evening. He showed me a shortcut to the Thai temple through the harvested wheat fields. A long but satisfying walk along the partitions of the dry fields took me to the Thai Temple. In one word, the Thai Temple (the only board outside read ‘Mahamongkolchai’) at Shravasti is grand. Sadly (from a shutterbug view) they don’t allow any photography inside! You’ve to take off your shoes the moment you enter the main gate and then deposit your electronic items to the Thai nuns/volunteers who’ll communicate with you with hearty smiles and ‘pleasant to ears’ Hindi. You’ll be checked with a metal/electronic detector and then allowed to step onto the large compound fully blanketed with green grass. The colossal golden statue of Buddha inside the Thai Temple. 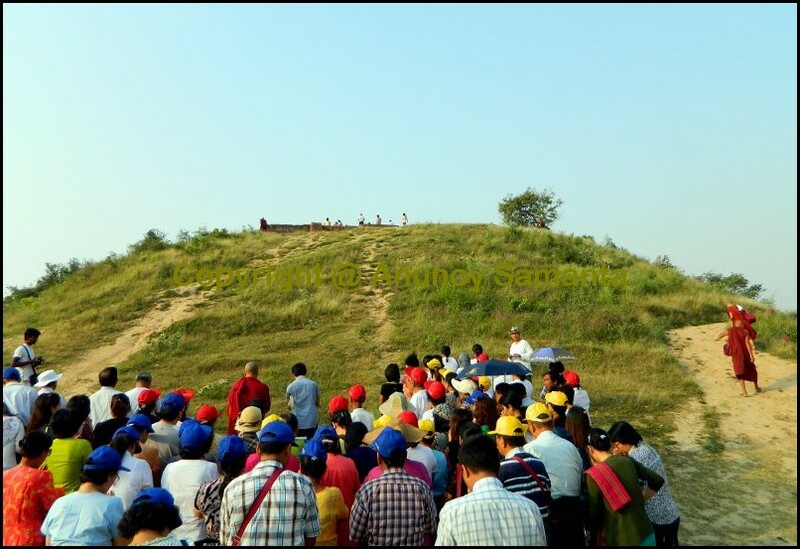 At first you’ll find a colossal golden statue of Buddha, after which you have to walk on the grass another few hundred meters to reach the exquisite meditation hall. Everything is so perfectly coordinated there that you may forget for a moment that you’re in an Indian pilgrimage site. You’ll be instructed to wash your feet before you step into the wax polished white marble floors of the meditation Hall. A nun told me to take off my cap (pardon my ignorance) and guided for a 3 minutes meditation. It was no more a surprise to me when she spoke good Hindi… though I discovered that most of them speak better Hindi than English. A beautiful gigantic stupa was under construction behind the meditation hall, the top of which was visible from kilometers away! Fully content with my experience inside the Mahamongkolchai Dhamma Devoted Land I stepped out of the gate and tried to compose some shots from outside. Even I ventured into the agricultural lands and bushes surrounding the campus but this paparazzi efforts failed before the high boundary walls guarding the temple area! 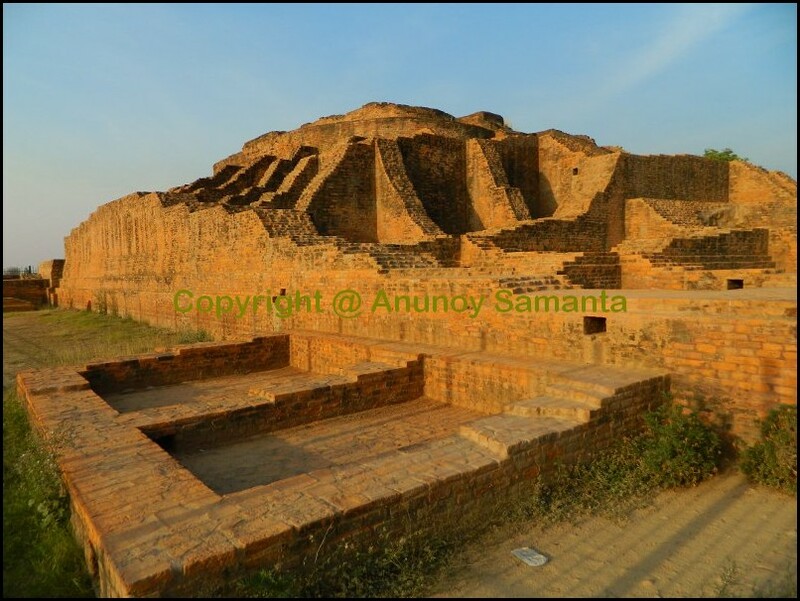 Ruins of a Jaina Temple, known as the Temple of Sobhnath. I kept walking farther taking the metaled road to reach Maheth, the ruins of the ancient fortified city of Shravasti situated on the bank of River Rapti. The cheese-smooth black road provoking the motorcycles to fly like dragonflies, amidst crippled village economy and historical remnants wasn’t quite matching for me. I failed to figure out whether it was the result of Pradhan Mantri Gram Sadak Yojana or a bit of generosity from the Government’s side in the name of tourism/pilgrimage promotion. The ruins within Maheth include Buddhist, Brahmanical and Jaina Structures along with few medieval tombs which were listed in the form of a map by ASI to help the tourists. I first visited the Jaina temple of Sobhnath, which is believed to be the birthplace of Sambhavanatha, the third Jaina Tirthankara. This Jain temple, as per the information by ASI, was built on a rectangular plan consisting of different strata and it has also undergone subsequent extension, addition and superimposition. Another excavated structure at Maheth. I resumed my walking into Maheth for exploring the other remains. The fact that there was not a single traveler walking like me, all being grouped in motorbikes, tuktuks, cars, jeeps or SUVs was making my limbs more fatigued than they real were! I reached the next spot, Pakki Kuti which is excavated remains of a stupa and one of the two largest mounds inside the city area. Sir Alexander Cunningham had proposed to identify it with the remains of the stupa of Angulimala as seen by Chinese pilgrims Fa-Hien and Hiuen-Tsang, although according to another view it represents the ruins of the ‘Hall of Law’ built by King Prasenjit in the honour of Buddha.the general layout of the structural remains represent constructional activities of different periods. This info won’t be complete without a short note on Angulimala. Angulimala was a cold-blooded slaughterer of human lives to cut one finger from each victim to incorporate in his necklace (that is how he derived his name) till his necklace becomes full with hundred fingers! He committed the worst sin by killing his own mother being desperate for the 100th finger and that is when his destiny brought him before Lord Buddha who delivered him from his evilness. Later, Angulimala became one of Buddha’s greatest disciples and till today his Sutra is read by monks to pregnant women with the belief that it’ll decrease the pain of delivery. Diagonally opposite to Pakki Kuti, lies Kachchi Kuti which is the most imposing monument in the area. It is known as Kachchi Kuti in view of the fact that a sadhu made temporary shrine of Kachcha bricks on the top of this structure. Dating from Kushan period, it went through various renovations in later periods. 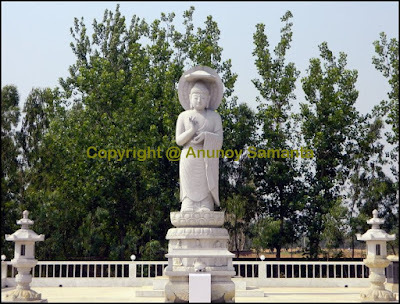 A group of scholars proposes it to identify with the stupa of Anathapindika (one of the chief disciples of Buddha who was a rich merchant) as seen by Chinese travelers, but according to another view, a large collection of T.C. plaques showing in high relief scenes from the Ramayana suggests its identification as Brahmanical temple. A monk chanting down the mound of Orajhar. I followed the same road while returning back from Maheth but didn’t take the field-shortcut to my lodge. I came across the Chinese temple face to face with the Burmese temple. The gardener who was busy to drive away monkeys from the garden with a catapult, told me that the temple was closed for the day… off course it was not shocking… the sun had set after baking me wholeheartedly for two-three hours! He advised me to skip the Burmese temple for the time being and to visit Jetavana under the coldness of evening. He was not supposed to know the photographic limitations in low light but I had to face it… till then I took his idea. 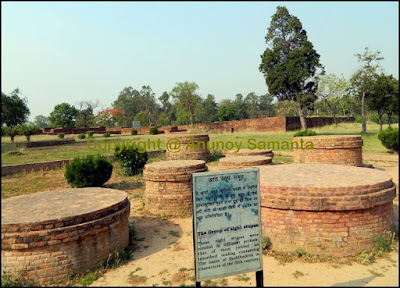 Ruins of Saheth, which are supposed to represent Jetavana (Jetavana Anath Pindak Mahavihar) are spread within an irregular enclosure enclosing numerous excavated Buddhist structures like sacred Anand Bodhi Tree, Kosamba Kuti (residence of Buddha), Gandha Kuti (main residence of Buddha), Bhante Anand Kuti, water well used by Buddha, Chakkaman place of Lord Buddha, Bhante Angulimal Kuti, Bhante Seevali Kuti, Arahata Asta Stupa, Rahula Kuti, Sangharam Monastery, Rajikaram Monastery, cremation ground for Bhikkus etc. 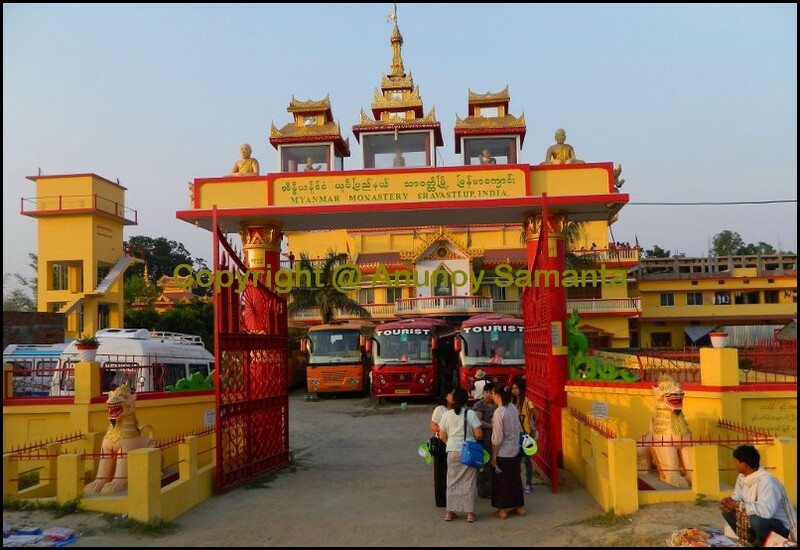 A nominal entry fee is charged for entering Jetavana and you’ll come across several groups of pilgrims from different countries. If you’re traveling solo like me your best bet will be to join any group, off course whose native language is comprehensible by you, so that you can learn the historical facts attached to different ruins from the narration of their guide. You’ll probably enjoy the free entertainment provided by the apparently innocent monkeys of different age-groups native to the place. I was tired enough for the day and lost my sincerity to what the guide spoke. So here I won’t speak more of Saheth/Jetavana… don’t worry, I’ll tell you all these tales in subsequent paragraphs as I had made it a point to revisit Jetavana next morning. Oh did I mention of the Sri Lankan Temple opposite to the entrance of Jetavana? A Buddha statue inside the Korean Temple. I was tired, hungry and left with hurting soles. I pushed on to reach the main Balrampur road and found some small tea shops. The only roadside Dhaba which offers meal was without staffs that time, so I settled for tea and Samosa in the adjacent stall. I passed by two Jain temples and made a note to visit them next morning. Before it was eight I called it a day in my first day wandering in Shravasti. My host seemed to have a good stock of soft-drinks and mineral water for his tourists. I revitalized my aridness with few sips of coke. My room could be enough spacious if there weren’t six single beds… because, the lodge usually accommodates large groups of pilgrims in season (October to March). But right then I was the sole sleeper of six beds (had to pay for the whole room though) and single user of the attached bathroom which had a western style latrine hot water supply round the clock and a manageable wash basin… what else do you want in the simple world of Shravasti? I was informed beforehand that electricity will be supplied only after evening as they’ve to depend on their inverter supply. It was well past evening, so I could enjoy the fan at full speed. 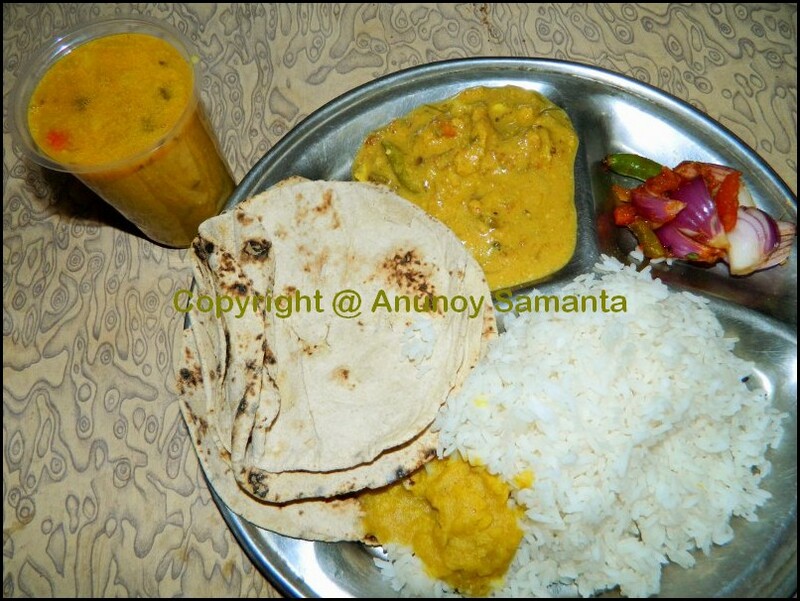 The monk himself had ordered my dinner from that nearby Dhaba and the hot food appeared by nine. The food was poor in presentation but palatable enough to make me finish all five rotis with the last grain of rice. The pungent fumes from burning mosquito repellent coils had cleared my room of those flying imps but there was no remedy to the small insects playing on white bed sheet. I tried to induce sleep but I couldn’t… at least not before midnight when I felt the pinch of a bedbug (I’m not sure whether there was a bedbug!). The monk himself had ordered my dinner from a nearby Dhaba and the hot food arrived by nine. Strangely the early morning breeze of the holy land of Shravasti woke me up before my mobile alarm! Last night I had kept a window (don’t worry, it had a safety net) open to ventilate my insect infested room. In my golden light of the early morning I rediscovered the wide open beautiful village landscape behind my lodge. I could even see the shining golden top of the distant Thai Temple. May be, I wanted to sit by the window side and stare at the morning panorama like an adolescent boy but I wanted to commence my traveler’s walk and cover the remaining spots before the sun loses his temper. A quick shower in lukewarm water was enough to turn me on with my backpack on the sparsely populated roads of Shravasti. Skipping my morning tea I headed on the Balrampur state highway. A brief stroll took me to the Myanmar Monastery on the right side of the road. Its courtyard was full with tourist buses and I saw a plenty of Asian tourists/pilgrims as I entered their block. 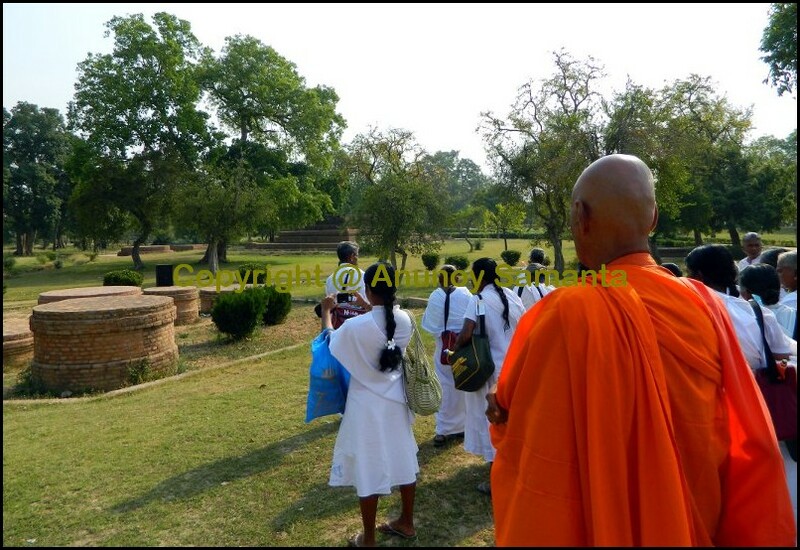 Yes they offer accommodation like many other monasteries/temples at Shravasti. From the ambiance it seemed that the bus staffs were busy in loading the baggage of tourists, i.e. they were also gearing up to accompany me in the trip. The adjacent lane took me to the Shechen Stupa For Universal Peace which was built in fulfillment of H.H. Dilgo Khyentse Rinpoche’s vision. Nearby I found another small monastery where morning prayer was going on but there was no information board outside to know its name. A busy lama told me it was Saraswati Monastery. The wheels under my feet overpowered my religious self once again and I came out of the lane to resume onto the highway instead of joining the holy prayer. A brief stroll took me to the Myanmar Monastery on the right side of the road. Those red tourist buses hurried past me but who cares… after all, slow but steady wins the race right? I reached the site of Orajhar (holy ruins on a small hillock) to find those Asian groups were being lectured by their guides. Unfortunately their language (perhaps Thai/Korean) was out of my comprehensive skills, so I hiked the hillock leaving those sincerely attentive pilgrims at the base. 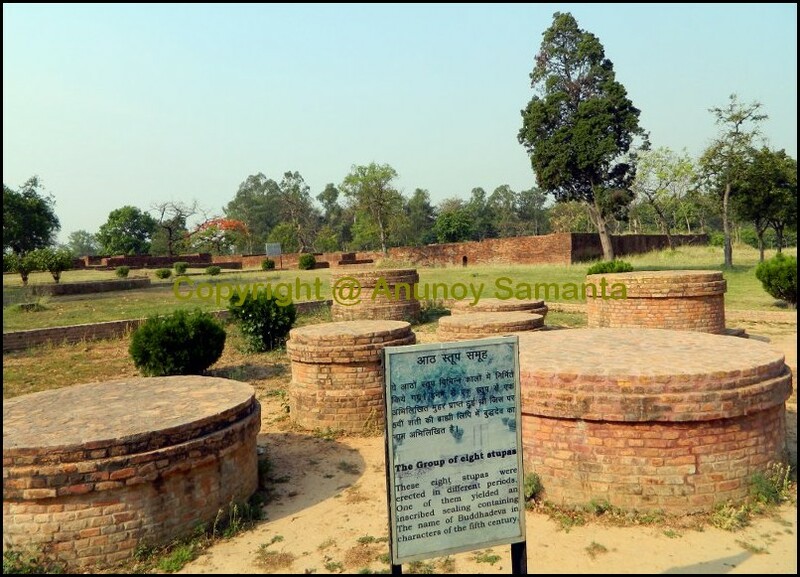 Orajhar is situated on the left bank of Khajua, a tributary of River Rapti where excavation has revealed a threefold cultural sequence, starting from Kushan period followed by Gupta and medieval periods. It is said that Orajhar is the sacred site from where Lord Buddha had traveled to heaven to preach His mother Mahamaya the lessons of Abhidharma for three months to help her attain ‘Arhatwa’ (similar to stage of enlightenment, please refer some genuine source for the exact understanding of this term). This transcend to heaven from Orajhar is considered as one of the three miracles by Buddha! I reached the site of Orajhar to find those Asian groups were being lectured by their guides. After descending from Orajhar I finished my breakfast with tea, boiled chana and jalebi and took the diversion to Kandhbhari-Ghughulpur village to reach my next destination, Purvaram. The rough village path had pricked the yesterday’s tenderness of my soles once again and I started feeling each and every ten meters, I covered. When I asked a man about the direction a boy came to me and asked “Don’t you know the way to Purvaram?” I could read his unsaid words, so I patted him and told, “OK show me the way… so do you like chocolate or samosa?” He was Ajay, a schoolboy of third standard, was enjoying the Ramnavami holiday in his maroon-white school uniform. Purvaram turned out to be much more lusterless than what I had expected. There was only two-three hut like non-concrete structures, remain of the Ashoka Pillar (which is worshiped by Hindus as Shivalinga) and a small ongoing construction site. The main monk of Purvaram Bhante Vimal Tiss was on a journey to Gujarat, so the caretaker teenage boy Avneesh showed the things and narrated the stories of Purvaram. Maha Upasika Mata Vishakha had constructed the grand Dhamma Palace of Purvaram with great devotion to provide shelter to thousands of Bhikkhus and this was the place where Lord Buddha had spent his six rainy seasons, preaching his most important 23 Sutras! Avneesh narrated how the magnificent establishment was shattered and Bhikkhus were slaughtered by Muslims, which is evident till today by the cut mark on the ruin of Ashoka Pillar! I made my small contribution to their effort of rebuilding Purvaram Mahavihar with its historical glory and resumed my journey. Avneesh was helpful enough to show me a shortcut to Jetavana… he actually escorted me through the puzzling but beautifully green village neighborhoods. He finally left me when I could see the metaled road from a distance along with the Burmese Temple which I had spotted in the last evening. I entered the Burmese Temple and found a gang of monkeys boldly accessing the temple fruit stocks! 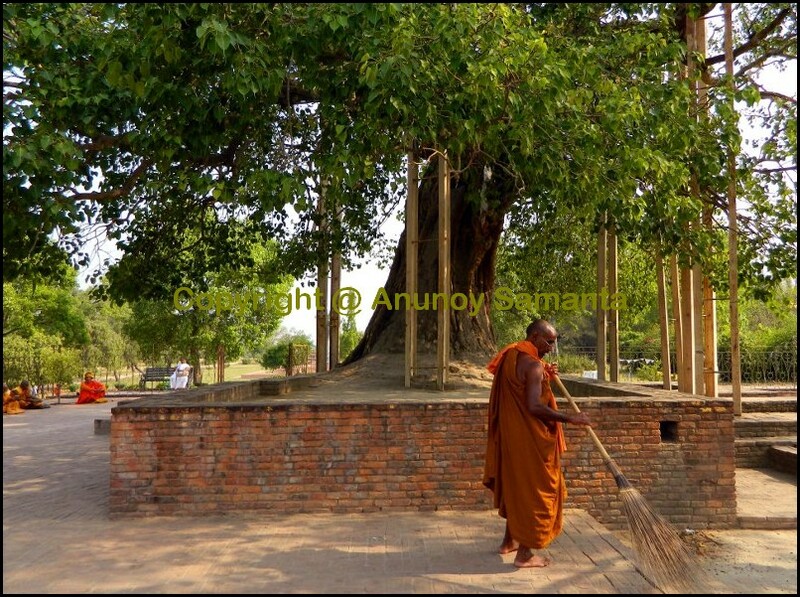 The Anand Bodhi tree is the second holiest tree for Buddhists, first being Mahabodhi Tree of Bodhgaya. I couldn’t skip visiting Jetavana once again. 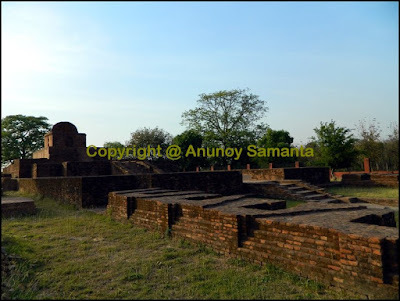 As I said before, ruins of Saheth, which are supposed to represent the present day historical park of Jetavana (Jetavana Anath Pndak Mahavihar) are spread within an irregular enclosure enclosing numerous excavated Buddhist structures like sacred Anand Bodhi Tree, Kosamba Kuti (residence of Buddha), Gandha Kuti (main residence of Buddha), Bhante Anand Kuti, water well used by Buddha, Chakkaman place of Lord Buddha, Bhante Angulimal Kuti, Bhante Seevali Kuti, Arahata Asta Stupa, Rahula Kuti, Sangharam Monastery, Rajikaram Monastery, cremation ground for Bhikkus etc. This was the same holy place where Buddha had spent his 19 rainy seasons preaching his most important lessons (his longest stay at any place!). It is said that the Jetavana monastery was dedicated to Buddha by his greatest follower Anathapindika who had purchased the land of Jetavana from Prince Jeta in exchange of as much gold as it was needed to carpet the whole land! There were few groups of pilgrims but unluckily all of them were non-English/non-Hindi speaking, so I kept wandering inside the sacred park trying to gather information from those info-boards. 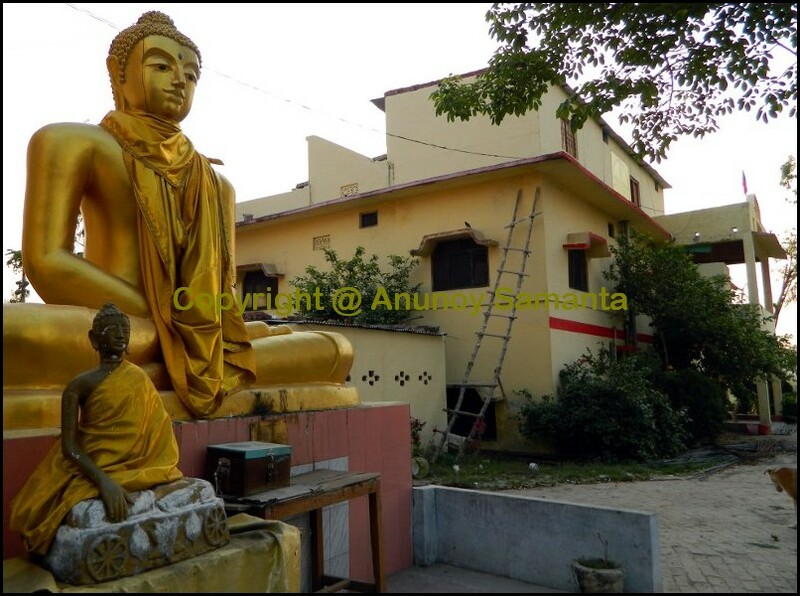 The most sanctified place in Jetavana is the Gandha Kuti (means: fragrant chamber) which Buddha used as his main residence. Contemporary devotes offer flowers and incense sticks in Gandha Kuti to keep its aroma intact. 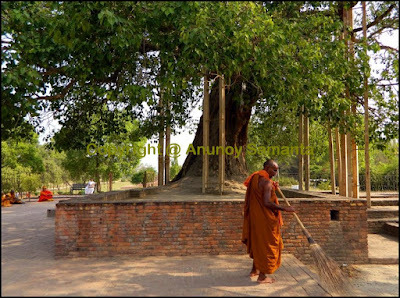 The Anand Bodhi tree is the second holiest tree for Buddhists (first being Mahabodhi Tree of Bodhgaya) which was planted by Bhante Ananda by bringing a sapling from the Mahabodhi Tree in respect of Buddha. Today, this few thousand years old (yet, green) Peepal tree stands with supports on its four sides but attracts millions of devotes around the globe to meditate under its shade! I met a Sri Lankan lady under the Bodhi tree who was on her pilgrimage to Buddhist circuit for 14 days. I was deeply touched by how poorest of Sri Lankan Buddhists take the pain of coming for pilgrimage, only for the call of religion! I came out to the state highway and reached the pink colored Digambara Jain Temple. The inside of the temple was finely ornamented but photography was a straight ‘No’. The Pujaari who was cleaning the statues of Mahavira told me how Jain pilgrims swarm into Shravasti in the same way like Buddhists and they get a preference in booking accommodation there… that’s fair enough right? 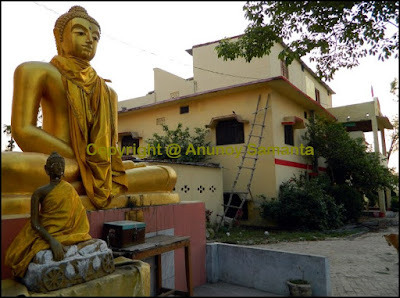 He suggested that best ‘value for money’ accommodation at Shravasti is the U.P. Tourism Bungalow which offers even AC rooms at reasonable rate. By hearing that they didn’t have electricity whole night I gave an invisible winner’s smile to myself for choosing a proper lodge that provided me fan and light whole night. Next to this temple lied the white colored Shwetamber Jain Temple. Unlike the Digambara temple, its exterior design on white marble was quite striking. Photography was ‘No’ in the inside of the temple, as usual. The instruction board outside the temple itself spoke everything of Jain austerity. I couldn’t suppress my desire to enter the Korean Temple that denied me a shelter last day. Before returning to my nest to conclude my trip to Shravasti I couldn’t suppress my desire to enter the Korean Temple that denied me a shelter last day. In the morning, Avneesh had narrated the incidence of a Korean lady getting murdered by an Indian scoundrel, after which they stopped giving accommodation to Indians! I really didn’t know whom to blame… yes, I was blank and flabbergasted! So I kept reading those Buddhist quotations (in Korean, Hindi as well as English) on their walls. 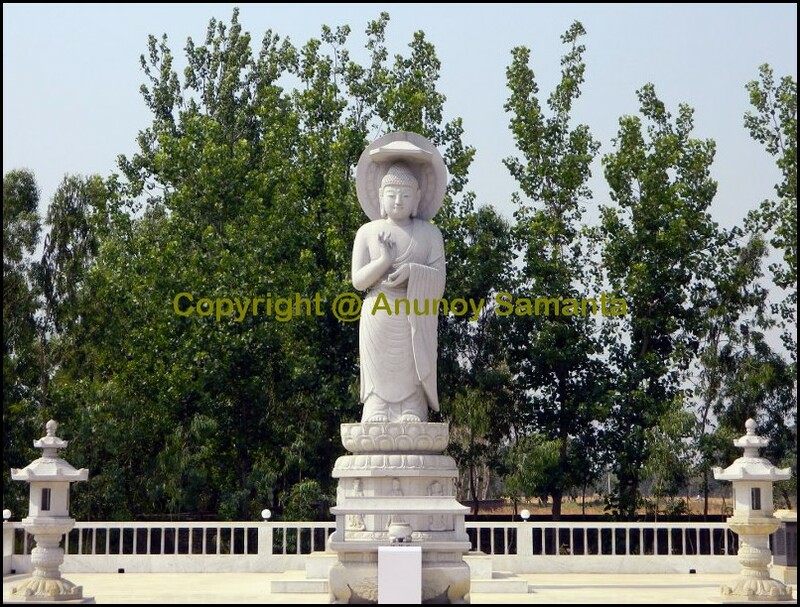 The white tall statue of Lord Buddha which you can see right from the entrance is splendid and I was happy to imagine how majestic would it look in a full-moon night! The inside environment was very calm and it seemed that hardly anyone was there in the big mansion. One quotation read “Happiness follows sorrow, sorrow follows happiness, but when one no longer discriminates between happiness and sorrow, a good deed and a bad deed, one is able to realize freedom”. Ruins of Saheth, which are supposed to represent the present day historical park of Jetavana are spread within an irregular enclosure enclosing numerous excavated Buddhist structures of high religious significance. Soon I was back to my room, rather bathroom… I needed a cold bath after the 4+ hours of exhaustive wandering. In half an hour I was down on the state highway once again with my backpack, waiting for my bus. My trip to Shravasti was over for this time and I was content, having explored Shravasti entirely and that too solo on my feet. 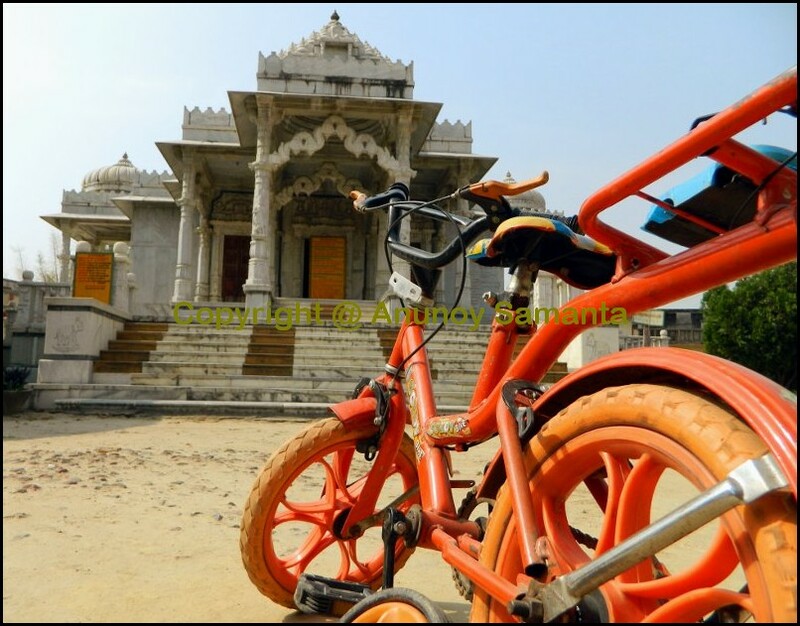 Travel to Shravasti without any apprehension as staying options are plenty, transport options are in abundance… food may be a problem for the choosy folks but I think a true traveler never selects his/her destination on the basis of food availability. By now, surely you’re giving an affirmative nod. Let me explore the Buddhist Circuit at my own pace. 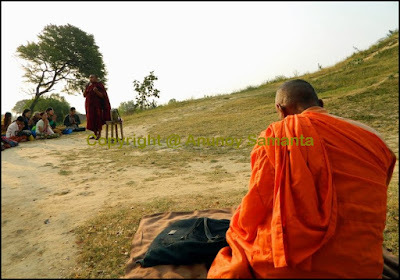 In the meantime, you might enjoy going through my travel tale of Lumbini or motorcycling travelogue of Bodh Gaya. Good info and nicely written. One question- Why can't you increase the size of pics? Four of the most loved experiences of Thailand travels from some of the most renowned globetrotters' journals are listed below:Go Scuba Diving at Ko Tao: Scuba enthusiasts call it the diving Mecca, as Ko Tao is a fabulously lush island blessed with crystal clear water full of coral reefs. http://eliburan.com/bangkok-grand-palaces-wat-phra-kaeo/ Thailand Tours are known for Thailand's breathtaking natural beauty, inspiring temples, and the most excellent beaches of the world.